Let me tell you a secret: recycling is so last season. The new big trend in sustainable fashion is “upcycling”, which finds itself as the green-to-glam idea starting with the letter U.
Upcycling means not just reusing something, but actually making it better by adding value. In other words, it is worth more in its new form. To give an example, turning plastic bottles into more plastic bottles is recycling, whereas turning plastic bottles into a designer garment is upcycling. And it seems upcycling is taking the design and fashion industry by storm. In the fashion world, designer Orsola de Castro is known as the “Queen of Upcycling”. Her brand “From Somewhere” uses top quality leftover fabrics from high-end fashion labels to create unique and zero-waste clothing. Her “Unity” dress made out of discarded Speedo Olympic swimsuits drove the fashion world into a fine frenzy in 2012. 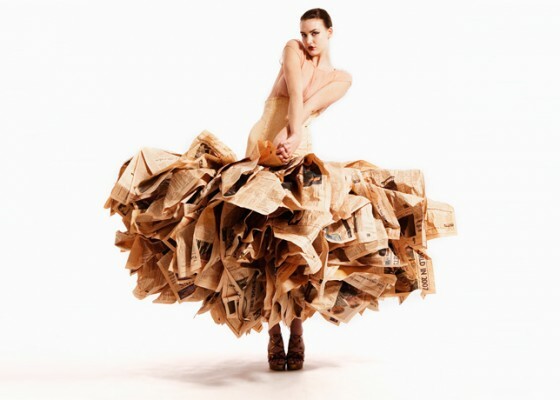 If you think that’s already stretching fashion design too far, how about a dress made out of newspapers? “If you saw the dress made from Financial Times newspapers that caused a stir back in 2007, you’ll know the ‘wow’ factor that Gary Harvey creates. One of the original up-cycled designers, his unique re-use of iconic materials and ultra-feminine structured silhouettes have been changing the way the world views fashion,” reads the designer’s profile on Nueluxe. Coming back to the plastic bottles example, Design Academy Eindhoven graduate Michelle Baggerman discovered a way to transform plastic shopping bags into a “Precious Waste” textile that extends the bags lifecycle while remaining recyclable, writes Ecouterre. Furniture, of course, lends itself beautifully to the upcycling concept. 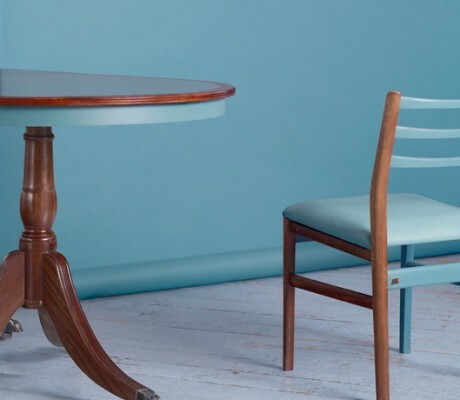 For example, the Living Furniture Project, uses recycled waste as raw material to create beautiful and bespoke furniture. The UK-based company only employs homeless people to do the work and partners with the best of London’s eco-designers. And I have also recently added an upcycled accessory to my own wardrobe: a canary-yellow belt by Elvis & Kresse made out of old rubber hose used by London firefighters. I find it uplifting to hear about such unique objects are given a new lease of life, and I do hope that upcycling will help sustainable fashion get the upper hand. After all, the only way is up, baby!